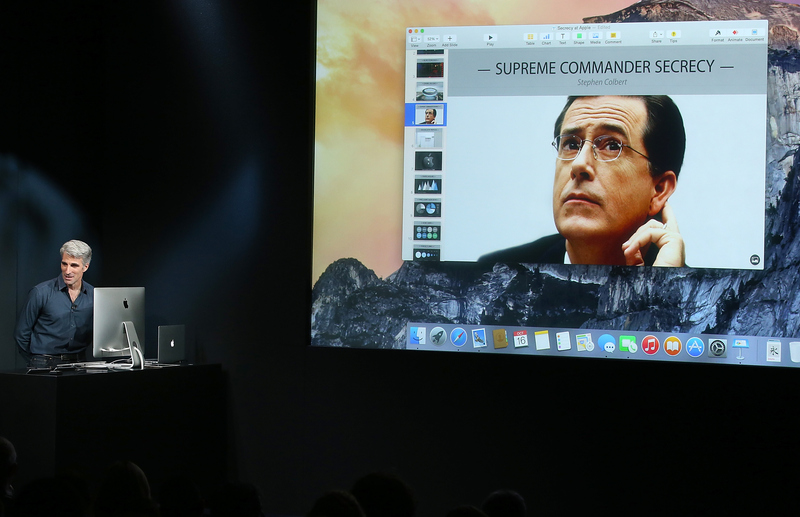 Political satirist Stephen Colbert added a dose of humor to Thursday's Apple launch event in Cupertino California, when he made a cameo appearance by phone as the company's "Chief of Secrecy." Speaking in strictly with code names, Apple's software chief Craig Federighi and the comedian had some fun highlighting the measures the company is taking to boost security efforts. "Hello Red Delicious, this is Granny Smith, over," said Federighi, prompting the Colbert to continue. "Is the squirrel in the basket?" Colbert asked conspiratorially. And he pondered whether the "Chief of Secrecy" title was lofty enough, suggesting "Supreme Allied Commander of Supersecrecy" or "Intergalactic Chancellor" instead. The humor about security efforts comes at a time when both consumers and law enforcement are increasingly concerned about hacking and privacy issues. Apple said it increased iCloud security after the recent hack that exposed celebrities' photos. In addition, its latest iOS8 operating system includes a level of encryption that means even Apple cannot access data on users' communications. The FBI has criticized Apple for making smartphone data inaccessible to law enforcement. However, the features may appeal to many Americans who are worried about security breaches from hackers and uncomfortable with the possibility of government surveillance. Thursday's event marked the unveiling of the new iPad Mini 3 and iPad Air 2, which Apple has hailed the world's thinnest tablet. The company also announced updates to its Mac computer line and said that its digital payment system, Apple Pay, will launch Monday.